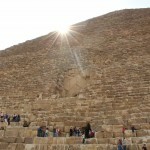 We purchased a ticket to visit the Meresankh III tomb at the Pyramids of Giza. According to Wikipedia, Meresankh III, was the daughter of Hetepheres II and Prince Kawab and a granddaughter of the Egyptian pharaoh Khufu. She was the wife of King Khafre. 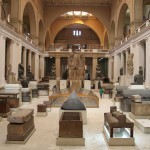 It was said that her death was sudden and unexpected, as the tomb was originally planned for her mother Hetepheres II, but was donated for her daughter’s use. She died at about 50 – 55 years of age. 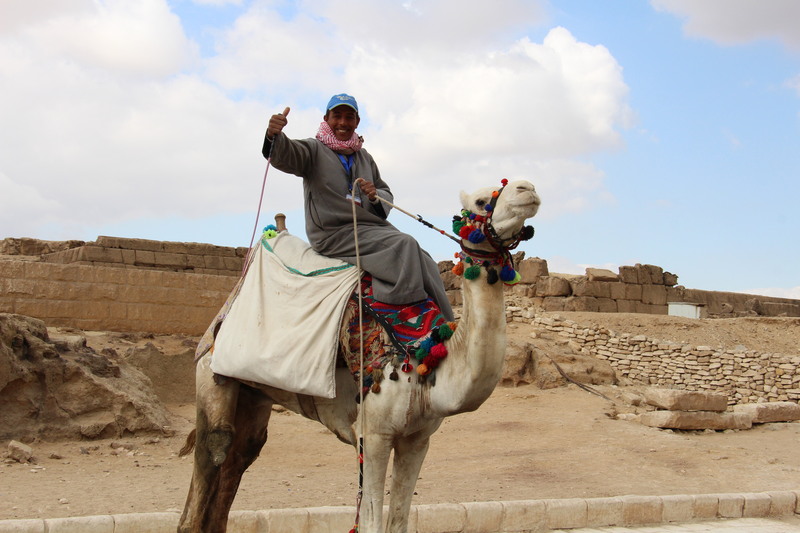 The visit to the Meresankh III tomb was our last stop, after the exhaustive and frustrating camel ride. The Meresankh III tomb was located near the exit, so we made it our last stop. It was already 1pm, and I was starting to get hungry. For some reason, we simply could not find the Meresankh III tomb. We followed a sign, which pointed us to the direction of the tomb, but we reached a broad path, and no one was around. We walked around in circles, until we came to an entrance where a group of school children were lining up to get in an underground passageway. And so we did – his colleague was 500m away. And this colleague shouted out to another colleague who asked us to follow him. At this point of time, the afternoon sun was shining through, and even though it was February, I was starting to perspire through my sweater. This particular man who we followed carried a large bunch of keys, and was slightly plump-ish. And the 8 min walk started, with him bringing us to a rather remote part of the Pyramid complex. It was clear that some tombs were under restoration. Friend S later told me that he thought we were going to get robbed, and was getting ready to ‘take that guy down’ should any untoward happen. 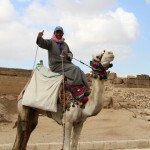 I was just struggling to keep up the pace with plump-ish Pyramid official, who was walking rather quickly. Finally we reached some sort of dead-end, and there was a white board, covered with a rusty pad lock and chain. I seem to have an impression that there was graffiti on the while board. Fishing out his large bunch of keys, Pyramid official unlocked the padlock and let us in. It was actually quite a nice place (much better than the insides of the Great Pyramid of Khufu which was dark and dingy). You could see the hieroglyphs from ancient times, and the statues of the women in Ancient Egyptian garb that adorned the tomb. Just then, the Pyramid official said, “You know, you get to take pictures if you like, but maybe with some baksheesh (tip)”. Sigh. Baksheesh again. As a matter of principle, we told him that we did not have to take photos. I think we should respect the rules of the attraction, even though I know the pictures would be great for this blog. I remember there was another level below. It was cool, and finally, I felt somewhat at peace as we were shielded from the noises of young schoolboys and cheating camel drivers. It was honestly, a great attraction and very worth the €50 ticket because we finally saw some remnants in the tomb, which were from ancient times. We signalled to the official that we would like to leave and he locked up. The chains made a loud clanking noise. We also gave him a €10 tip for taking the trouble to walk us to this rather remote tomb, and open it up for our private viewing. I didn’t get any photos from this experience, but it felt good. 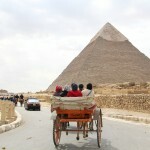 To know that somewhere around the pyramids, there are still statues and hieroglyphs which still remain. 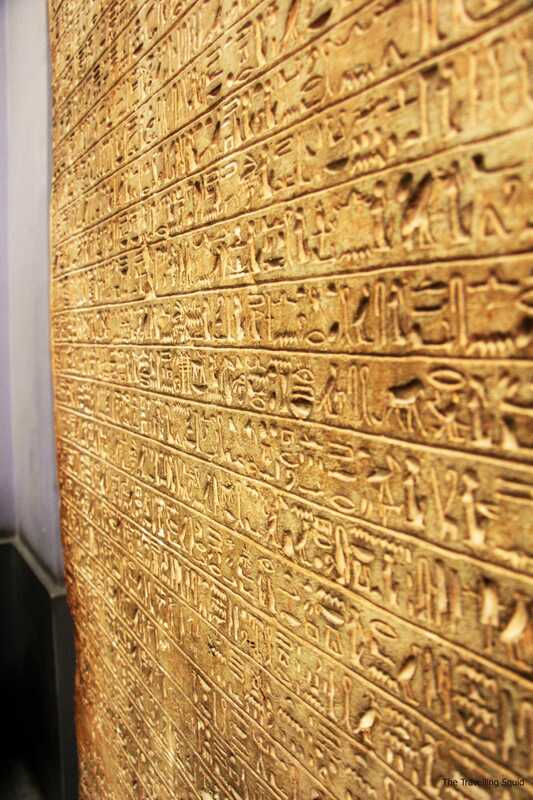 Examples of hieroglyphs from the Egyptian Museum. I could say this with great conviction, that the Meresankh III tomb at the Pyramids of Giza was the best attraction there. P.S) Unlike what is depicted in films, I could not make out what the hieroglyphs were trying to say. 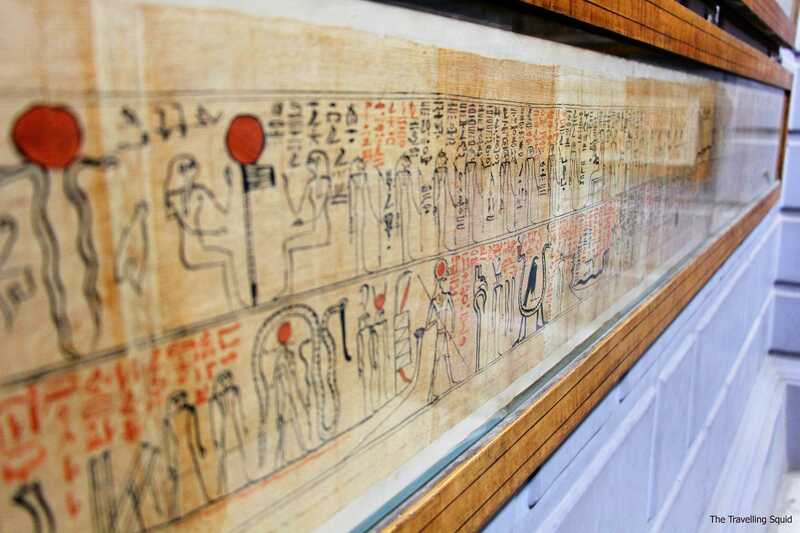 Note: The pictures of hieroglyphs are not from Meresankh III tomb, but are from the Egyptian Museum – just to give you a sense of what we saw.